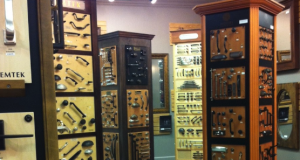 Our exclusive selection of bath hardware spans across multiple style, sizes, and finishes. When selecting bath hardware from NHP, it’s important to make the hardware accents fit in with the style of the room. Visit our showroom to not only see, but experience how details can make the difference. National Home Products stocks unique and decorative bathroom accessories and fixtures to help bring your bathroom to life. We’ve got the hooks, handles, bars, holders and racks to make it possible.